Rebecca and her grandfather Moshe, a Holocaust survivor, in Staten Island in the late 1980s. Every day, but especially on Yom Hashoah, I think about my family’s experience in the Holocaust and how that has shaped who I am today. As a young child, I didn’t fully grasp what being a Holocaust survivor meant. 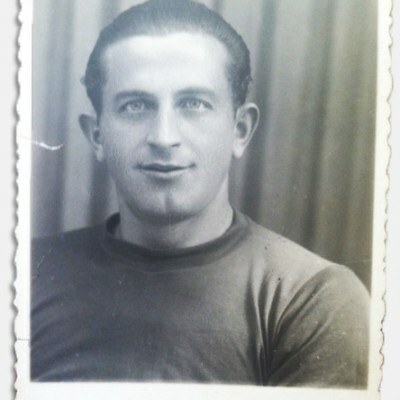 I knew that my grandfather had a big family before the Holocaust and that my great aunt had numbers tattooed on her arm. I knew that two of my great aunts were on line for the gas chambers at Auschwitz, minutes from cremation, when the camp was liberated. I knew that my mom dedicated her life to supporting the needs of Holocaust survivors—physically, emotionally and financially. But I didn’t know what all of these markers would truly mean to me. Ten years later when I was in college, I had the opportunity to meet Paul Rusesabagina, the Rwandan hotel manager who hid and protected more than 1,200 Hutu and Tutsi refugees during the Rwandan Genocide. I heard him speak during an event with the Hillel at Binghamton University. None of the refugees that he hid in his hotel were harmed during the genocide. He spoke about the genocide in Rwanda—what it was like to live through the violence, religious persecution and political strife. It was during his speech that I had my moment of realization; the moment when I realized that being a third generation Holocaust survivor was bigger than just carrying the story of my family. For me, being a third generation survivor meant taking a stand against injustice everywhere. 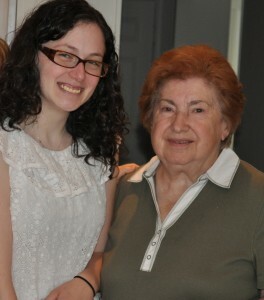 Rebecca and her great aunt, Faige, in Toronto, Canada in 2011. Faige was sent to a ghetto in Budapest during the Holocaust. I realized that while I couldn’t go back in time and change what happened to my family during the Holocaust, I could work to ensure that people around the world today experience dignity and safety—no matter their race, gender, sexual orientation, sexual identity or religion. I could honor the legacy of my grandfather, the rest of his family and the six million others who perished in the Holocaust by working to help access their human rights. I am so proud to work for an organization that allows me to do that work; to stand up for the rights of women and girls to live free of violence; to work to end hate crimes against LGBT people; to support indigenous people who are fighting for their right to land and water; and to help end early child marriage.